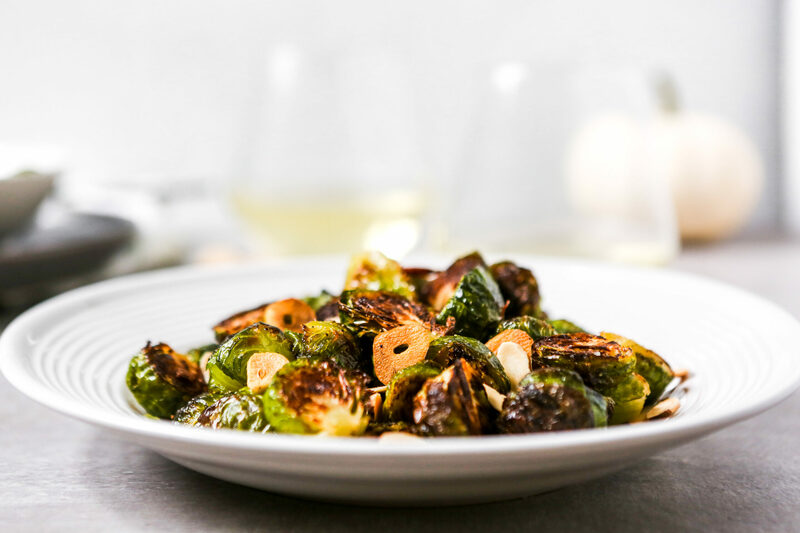 The tiny unassuming veggie shines in this ultimate Brussels sprout recipe. 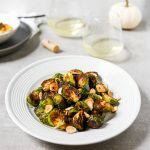 Deeply browned, and perfectly tender, these Roasted Garlicky Brussels sprouts make for a wonderful fall and winter side dish. We’re filling out this Cozy Fall Dinner Menu a bit backwards—starting with the side dish. Why? Well, even though it’s risotto week, I thought I’d break up the creamy risotto recipes a bit and give you something fresh. And because this recipe is so simple and so damn delicious that I just wanted you to have it. 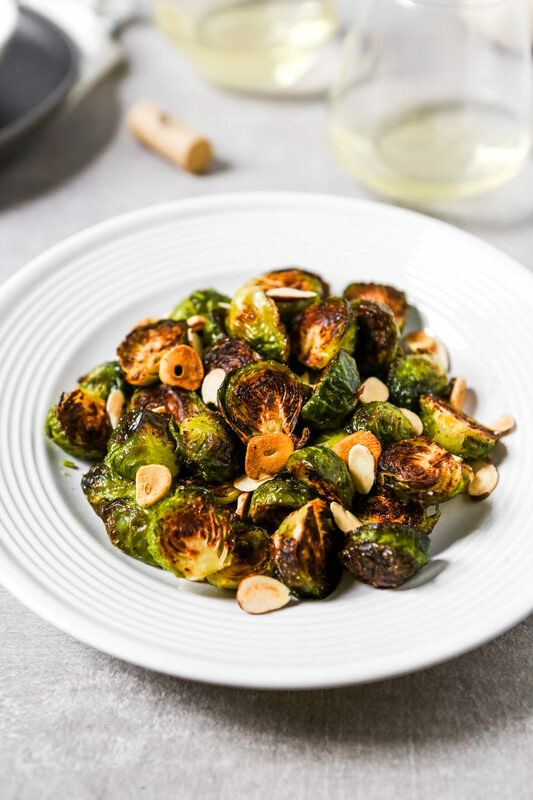 There a few simple tricks to perfectly roasting Brussels sprouts. A high oven temperature is key for achieving a deeply brown and evenly tender sprout. Why do we want to achieve browning? Flavor. It’s as simple as that, browning adds and enhances flavor. But we’re roasting! Yes, hear me out. Starting the cooking process of the sprouts by steaming them not only cuts down on total cooking time, but also ensure they get cooked through. But here’s the thing, it’s not an extra pan or stovetop step. You’re steaming and roasting in the oven, on the same baking sheet. How? A piece of foil. Yes, cook the Brussels sprouts covered for a few minutes, then uncover and continue roasting. Arranging the sprouts cut side down, and not stirring them throughout roasting, means they have the chance to adequately brown. 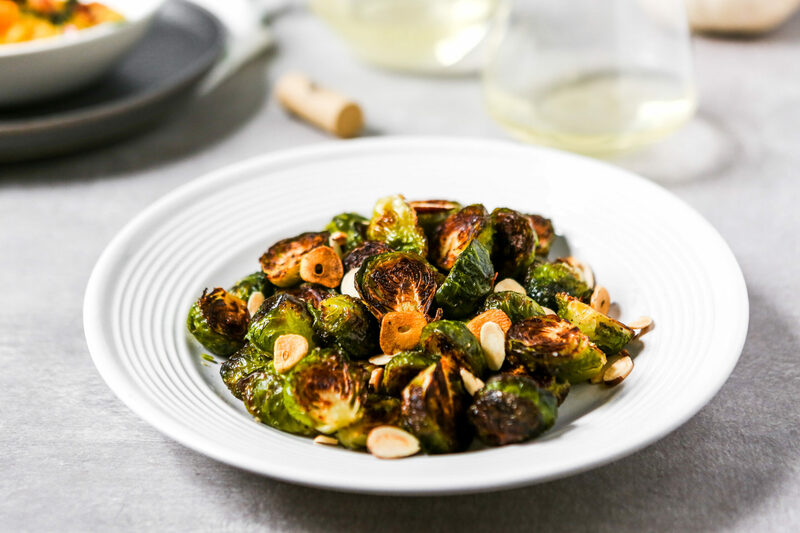 How should you serve roasted Brussels sprouts? 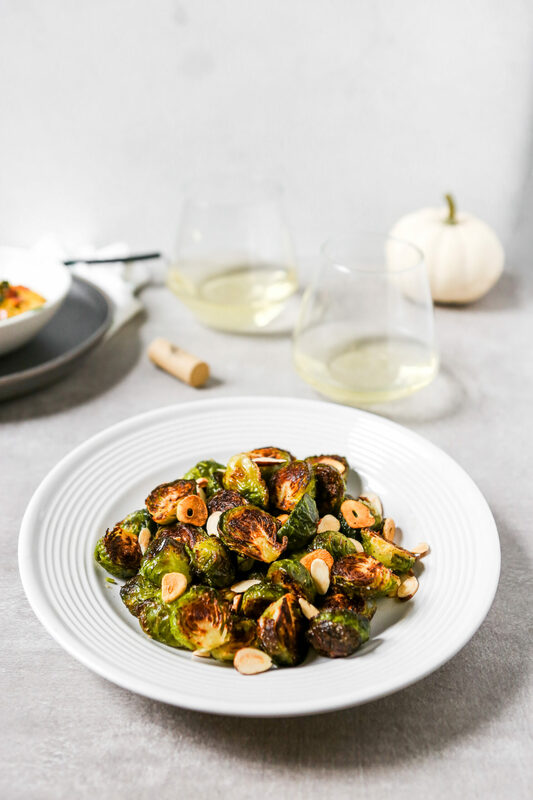 Check out this Cozy Fall Dinner Menu below for an idea of how to serve this Brussels sprout side dish. They’re also a great addition to any holiday dinner table—Thanksgiving, Christmas, Hanukkah, etc. Dessert: A pear tart would be delicious here, check out this Pear, Hazelnut & Blue Cheese Tart or Pear & Almond Tartletts. 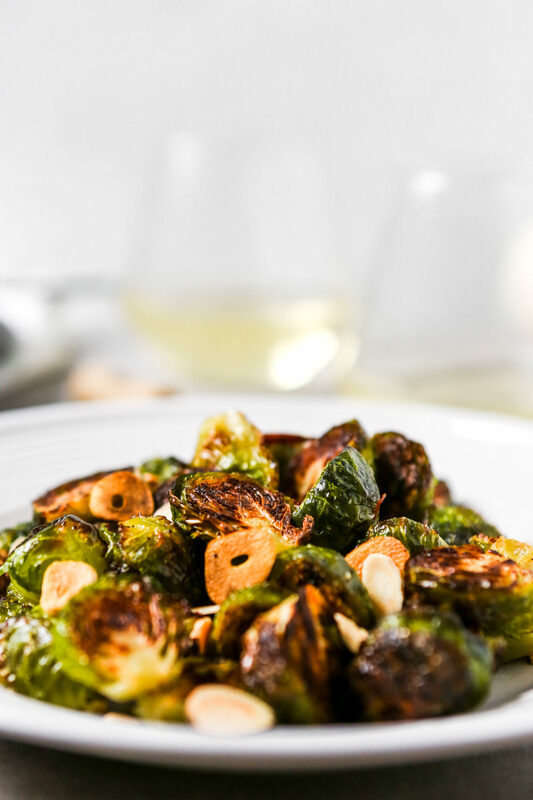 Deep brown, and perfectly tender, this is the ultimate Brussels sprouts side dish recipe. Heat oven to 500°F with rack set in middle position. Toss sliced garlic with 1 teaspoon oil; set aside. Toss sprouts with remaining oil to evenly coat; season with salt and pepper. Transfer sprouts to a baking sheet and arrange cut side down in a single layer. Tightly cover baking sheet with foil and roast 10 minutes. Remove foil from baking sheet and continue to roast 5–7 minutes more until deep golden brown. Add garlic to baking sheet and roast 2–3 minutes more until garlic is golden and toasted. Transfer sprouts and garlic to a serving dish and stir in vinegar and walnuts; season with salt and pepper.